John H. Coatsworth is the Provost of Columbia University, as well as Professor of International and Public Affairs and of History. 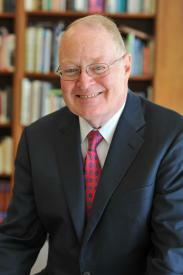 Provost Coatsworth is a leading scholar of Latin American economic and international history. Previously, he was Dean of the School of International and Public Affairs. Prior to his appointment as Dean in 2008, he served as a visiting professor at Columbia University (2006 – 2007) and Interim Dean of SIPA (2007 – 2008). Before joining Columbia, Coatsworth served as the Monroe Gutman Professor of Latin American Affairs at Harvard University (1992–2007). He was the founding director of Harvard’s David Rockefeller Center for Latin American Studies and the chair of the Harvard University Committee on Human Rights Studies. Prior to his work at Harvard, Coatsworth was a member of the faculty at the University of Chicago (1969–1992). Other academic posts have included visiting professorships at El Colegio de México, the National Autonomous University of Mexico, the National University of Buenos Aires, the Instituto Torcuato di Tella in Buenos Aires, and the Instituto Ortega y Gassett in Madrid. Coatsworth is a member of the American Academy of Arts and Sciences, the Council on Foreign Relations, the Board of Directors of the Tinker Foundation and numerous professional associations. He is the former president of the American Historical Association and Latin American Studies Association. Coatsworth has served on the editorial boards of scholarly journals including the American Historical Review, the Journal of Economic History, the Hispanic American Historical Review and other social science journals published in Britain, Chile, Germany, Mexico, Peru, and Spain. Coatsworth is the author or editor of eight books and many scholarly articles, focusing on comparative economic, social, and international history of Latin America, especially Mexico, Central America, and the Caribbean. Coatsworth received his B.A. in History from Wesleyan University, and his M.A. and Ph.D. in Economic History from the University of Wisconsin-Madison. Latin America and the World Economy Since 1800 (with Alan M. Taylor, edited, Cambridge: Harvard University Press, 1998).